Saguaro Cactus (Carnegiea gigantea) blossoms are the state flower of Arizona. The cactus is a very slow growing plant, which may add only 1 to 1,5 inches (2.5 to 3.8 cm) in the first eight years of life. The Saguaro grows arms or lateral stems but it may take up to 75 years to produce the first one. Saguaro are very long lived and many found in the desert are 175 years old. It is likely that rather than growing Saguaro cactus in the home garden, you may find yourself the becoming owner of a well established Saguaro when you buy a new home or build a home on land where Saguaro Cactus already grow. Saguaro have barrel-shaped bodies with peripheral stems called arms. The exterior of the trunk is pleated due to the way it grows. The pleats expand, allowing the cactus to gather extra water in the rainy season and storing it in its tissues. An adult cactus may weigh 6 tons or more when filled with water and requires a strong internal support skeleton of connected ribs. A young growing Saguaro cactus may only be a few inches tall as ten year old plants and take decades to resemble the adults. These cacti are native to and only grow in the Sonoran Desert. Saguaro are not found in the entire desert but only in areas that don’t freeze and at certain elevations. The freezing point is one of the most important considerations of where do Saguaro grow. The cactus plants are found from sea level up to 4,000 feet (1,220 m). If they are growing above 4,000 feet (1,220 m), the plants survive only on south slopes where there are fewer freezes of shorter duration. Saguaro Cactus plants are important parts of the desert ecology, both as habitat and as food. 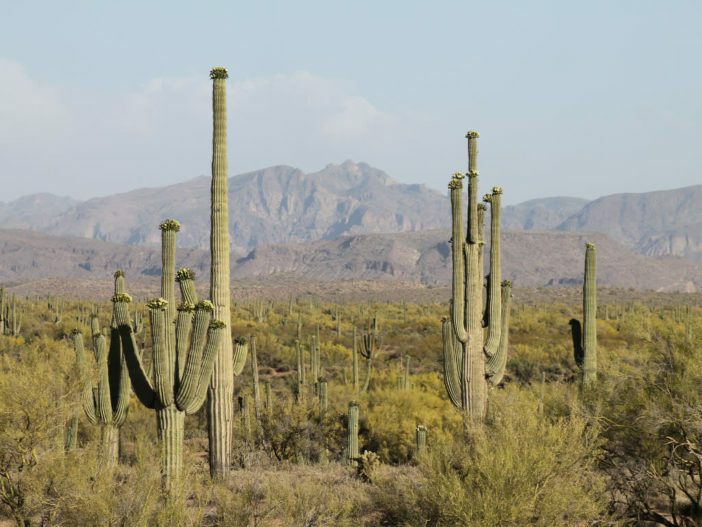 It is not legal to procure a Saguaro Cactus for home cultivation by digging it out of the desert. Beyond that, mature Saguaro cactus plants almost always die when transplanted. Saguaro Cactus babies grow under the protection of nurse trees. The cactus will continue to grow and often its nurse tree will expire. It is thought the cactus may cause the nurse tree to die by competing for resources. The nurse trees provide Saguaro Cactus babies with shelter from the harsh rays of the sun and dispersing moisture from evaporation. Saguaro Cactus needs to grow in well-drained grit and receive low levels of water, with the soil drying out completely between irrigation. Annually fertilizing with cactus food in spring will help the plant complete its growth cycle. There are common cactus pests, such as scale and mealybugs, that will require manual or chemical controls. Saguaro Cactus are slow to develop and may be 35 years of age or more before they produce the first flower. The flowers bloom in May until June and are a creamy white color and about 3 inches (7.5 cm) across. The Saguaro blossoms only open at night and close in the day, which means they are pollinated by moths, bats and other nocturnal creatures.. The flowers are generally located at the end of the arms but may occasionally decorate the sides of the cactus.